Happy New Year!! I hope you all enjoyed the holidays. My family and I had a lovely time Stateside. I intended to post from there but got busy catching up with friends and family, eating Chex mix and drinking red wine, and playing Scrabble. But now it’s back to London and after not cooking for over 2 weeks and everyone craving something homemade (and fighting off colds) homemade chicken soup is in order. 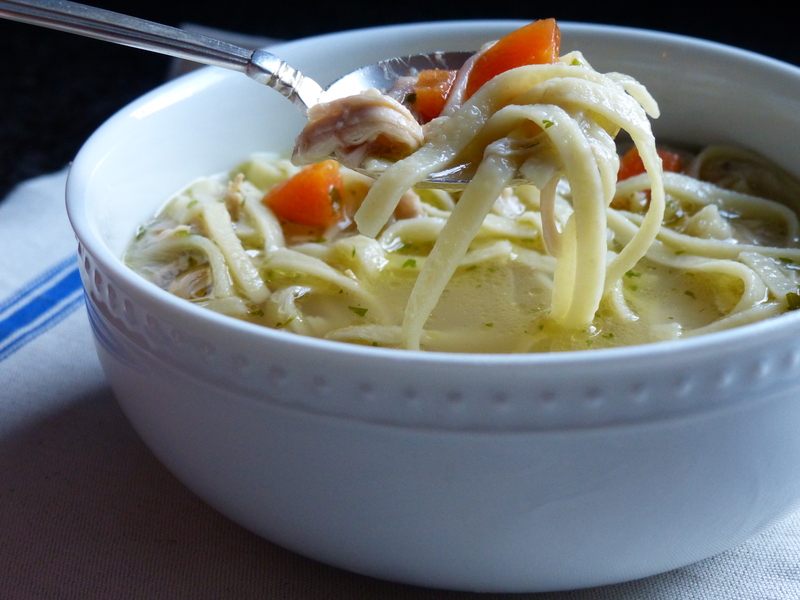 Homemade chicken noodle soup fits perfectly into those new year’s resolutions to eat healthy. It’s all fresh, whole foods – no processed ingredients. This is from-scratch chicken noodle soup like Grandma used to make. I’m gonna be straight with you. 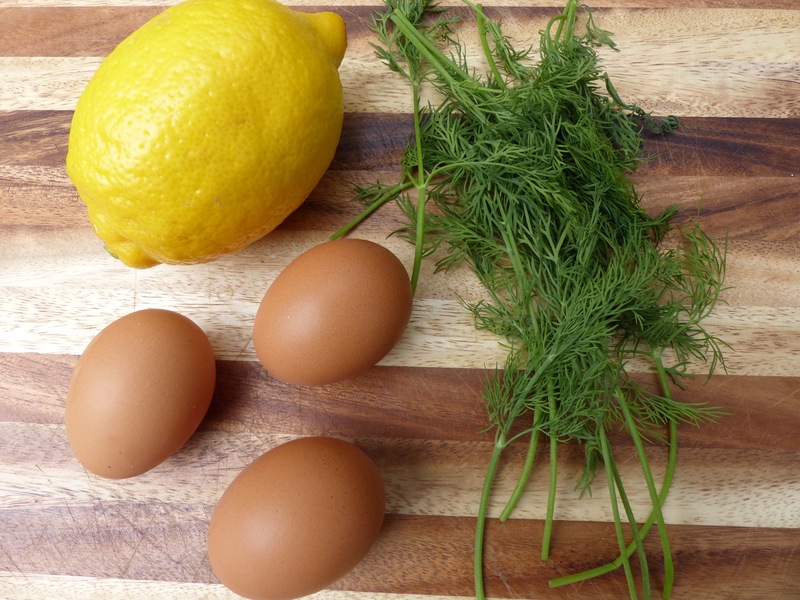 It does take a bit of time – a 30-minute-meal it is not. But it involves minimal work; the majority of the time is broth simmering. Start with a whole chicken. 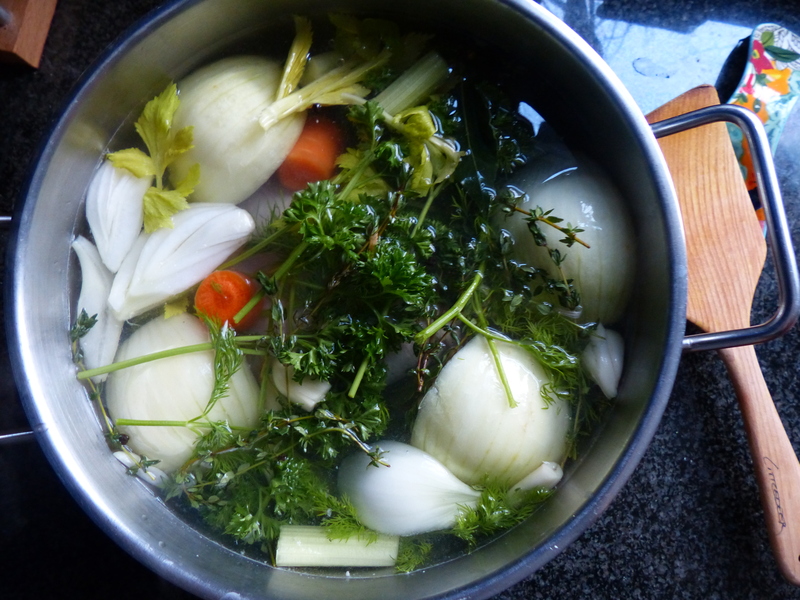 Put it in a large pot and add the flavorings for the stock: onion, carrots, celery, herbs, etc. Top off with water and simmer for a few hours. Strain out the solids, reserving the chicken and discarding the other solids (I first strain through a colander, then do a second strain through a mesh strainer). Simmering for those two hours releases collagen for the bones which lends an incredible silkiness to the broth. It also causes the soup to become gelatinous (chicken soup jello??) once cooled. This can be off-putting to some, but once you reheat it, you once again have a lovely chicken noodle soup. Back to soup making, once you have your strained broth back in the stockpot add your carrots and celery (diced, not the ones you used for the stock), once softened add noodles, then chicken and finally some parsley. Season with salt and pepper and you’ve got a genuine homemade meal. Grandma would be proud! Note: This makes a heartier soup, chock full of lots of chicken, noodles and veg. If you prefer a brothier soup, use only 1 carrot and 1 celery stalk. 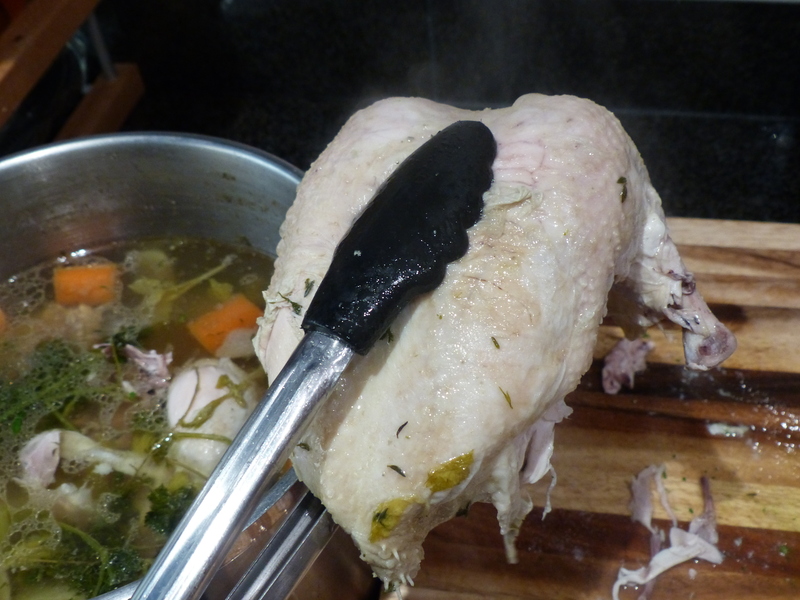 Also, if you have a chicken carcass left over from a roasting a chicken (or whatever you’ve used it for), use that instead of the whole chicken and just add 3 cups of shredded chicken left over from your roast or cook up a few breasts. 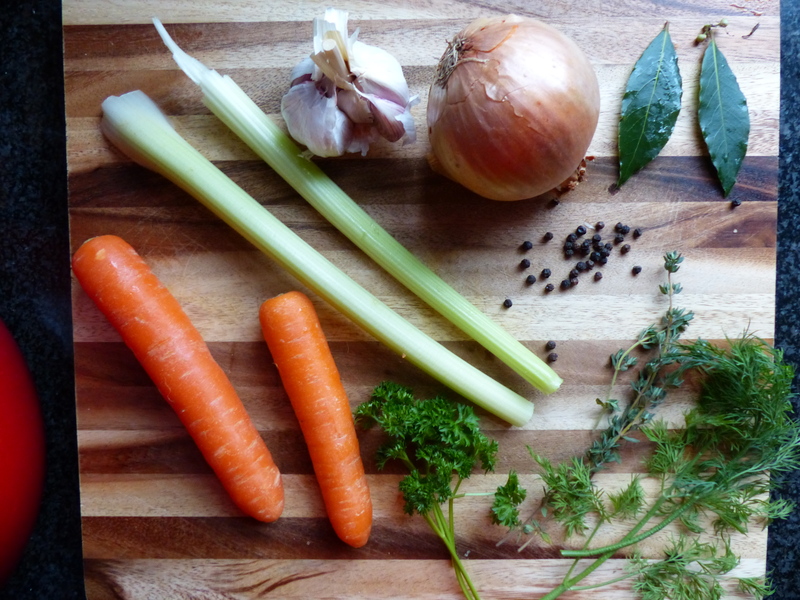 To make the broth: Combine chicken, onion, carrot, celery, garlic, herbs, peppercorns, salt and water in a large stock/soup pot. 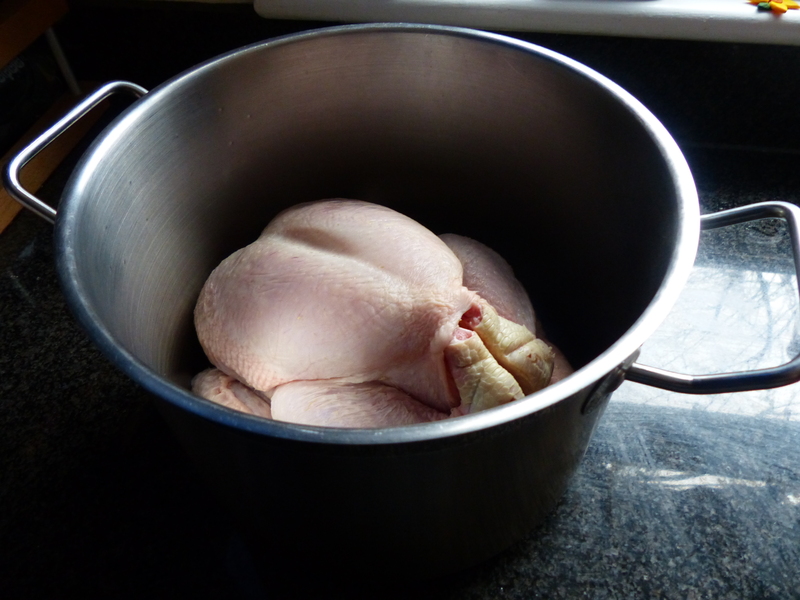 If water does not cover chicken, use a deeper, less wide pot or cut the chicken into 3 or 4 pieces so that chicken is fully submerged. Bring to a boil then gently simmer uncovered for 2 hours. 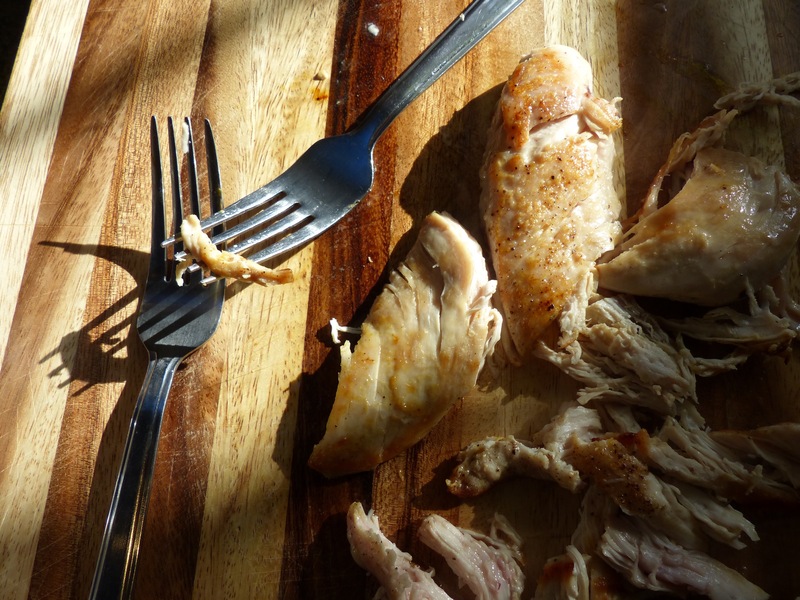 Remove chicken and place on a cutting board. 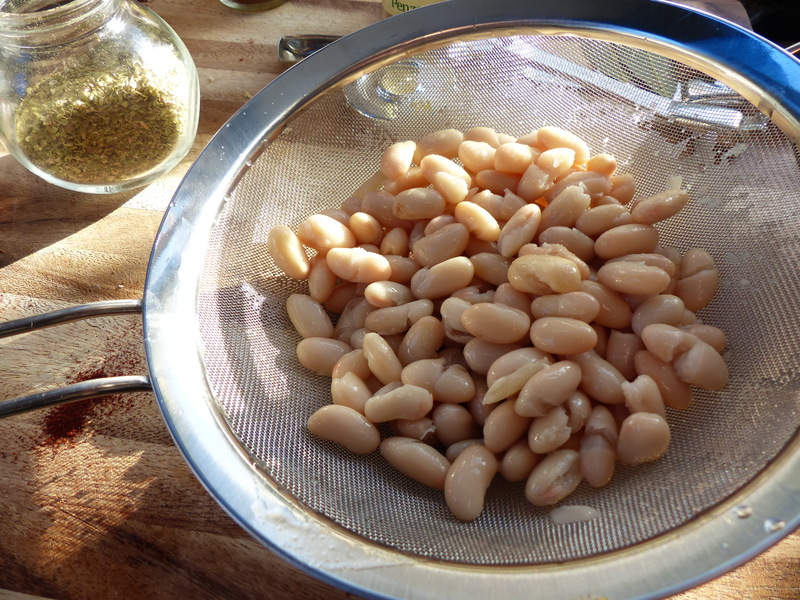 Strain the remaining contents of the soup pot in a colander, reserving the liquid. You should have about 2 quarts (2.3 liters) of stock. If you have more than that, return stock to the pot along with the chicken and other solids; if you have less, add water until you have 2 quarts. Discard the solids, except for the chicken. 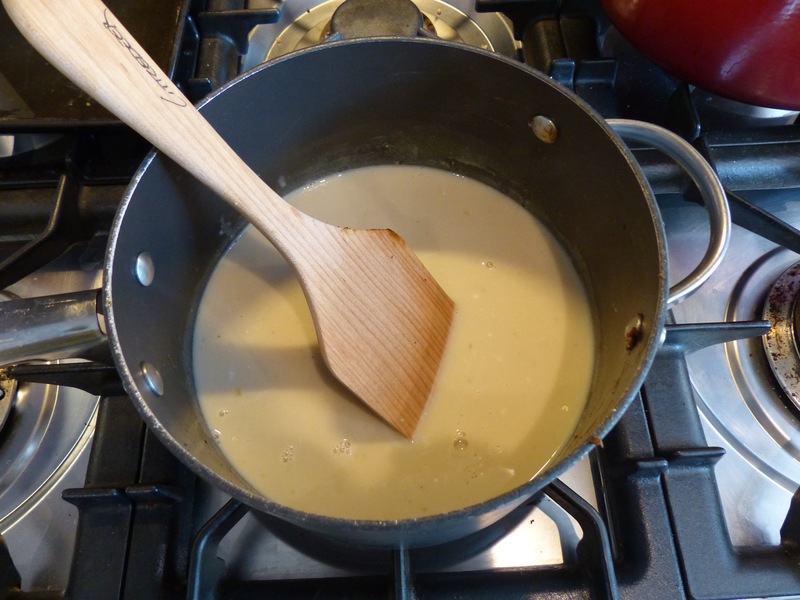 To make the soup: Return the strained broth to the soup pot and bring to a simmer. Add diced carrots and celery and cook until tender, about 15 minutes. While vegetables are cooking, shred chicken. Add the egg noodles and cook until soft; timing depends on brand and thickness (I used thin egg noodles that took 3 minutes, but others can take longer). Add chicken and cook until heated throughout, about 1-2 more minutes. Remove from heat and stir in parsley. If you want a more liquidy soup, add a bit of water. Season to taste with salt and pepper. 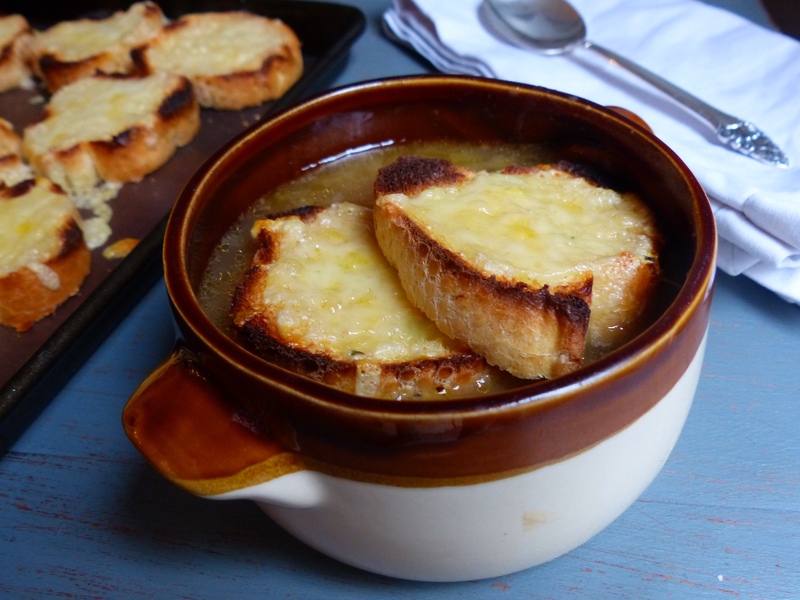 French onion soup is one of those things people love ordering at a restaurant because they don’t make it at home. There’s a certain mystique about this bistro classic: that cheesy topping, the floating toasts, the melt-in-your mouth onions. 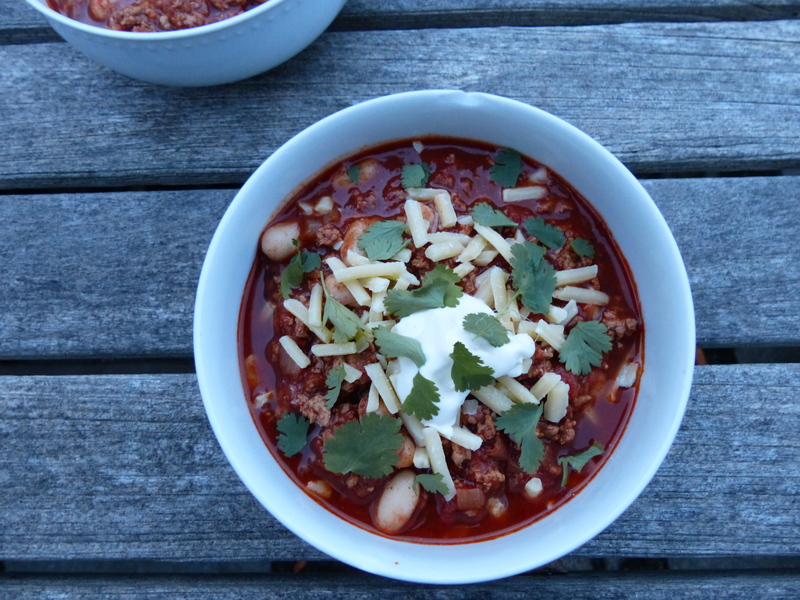 No way you could create something that delicious in your own kitchen. Way (pardon my lame Wayne’s World reference). 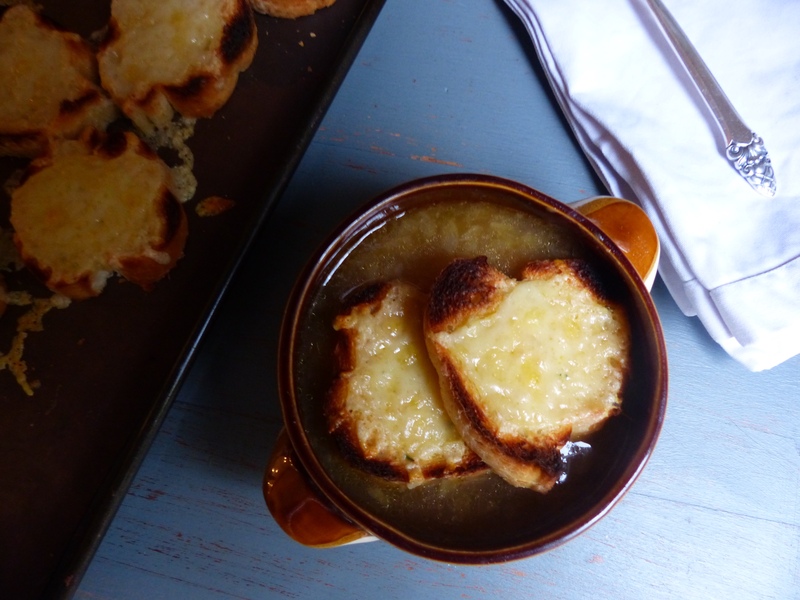 French onion soup is (1) simple and (2) inexpensive. 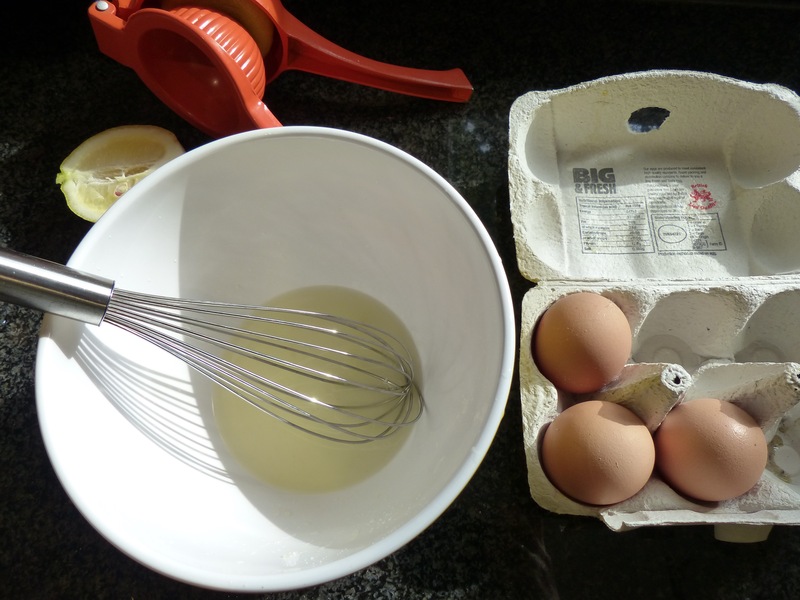 A whole batch costs nearly the same as one bowl at a restaurant – about £4 or $7. The key to perfect french onion soup is a long, slow cooking time. 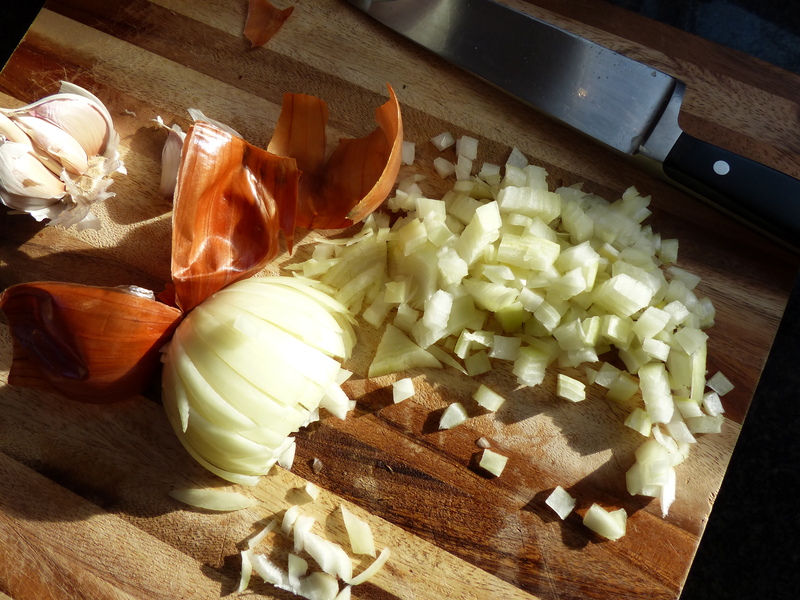 The prep takes about 5 minutes – just slicing some onions (slicing, so much simpler than chopping) – then they do their own thing on the stove for the next hour and a half, with occasional intervention on your part. The cheesy toasted topping tends to intimidate as well. Especially if you don’t have oven-safe soup bowls. Even if you do, removing broiling-hot bowls from the oven and then every two minutes reminding your soup eaters “do NOT touch the bowl” isn’t my idea of a relaxing dinner. That rigmarole is eliminated with cheesy toasts: baked separately then floated on top of the soup. Use any bowl you wish. You can even bake the toasts ahead of time and still have that cheesy goodness (I usually bake them during the final 10 minutes of the soup’s cooking time). Note: For the best tasting soup, use the maximum cooking times suggested below. Trust me, the longer the better! 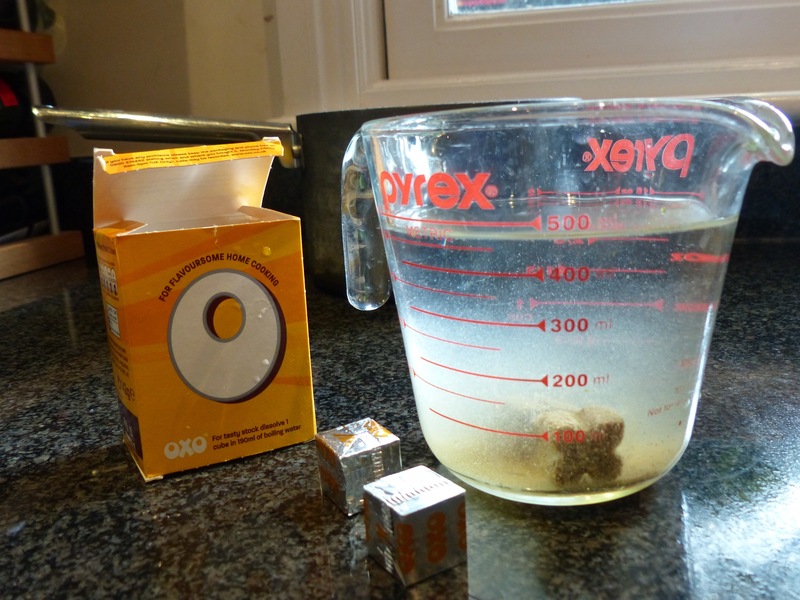 If using beef stock cubes, use double the recommended amount of water per cube. I used 1 cube per liter, whereas the package said to use 1 cube per 450 ml (broth will taste a bit watered down, but as it cooks for 30-40 minutes it will reduce and gain more flavor without being overly salty). Place onions, butter and olive oil in a Dutch oven or large (4-5 quart / 5 liter saucepan), cover, and cook slowly over low heat for 15 minutes. (I used a 7-quart Le Creuset just because that’s what size I have and I love using it for everything! But you don’t need to use something that big – 5 quart or 5 liter is plenty big). 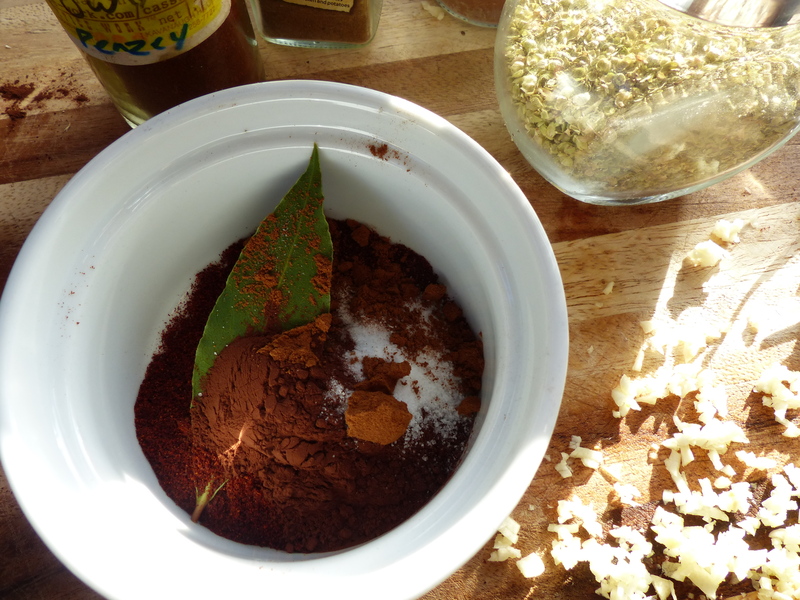 Uncover, raise heat to medium, and stir in the salt and sugar. 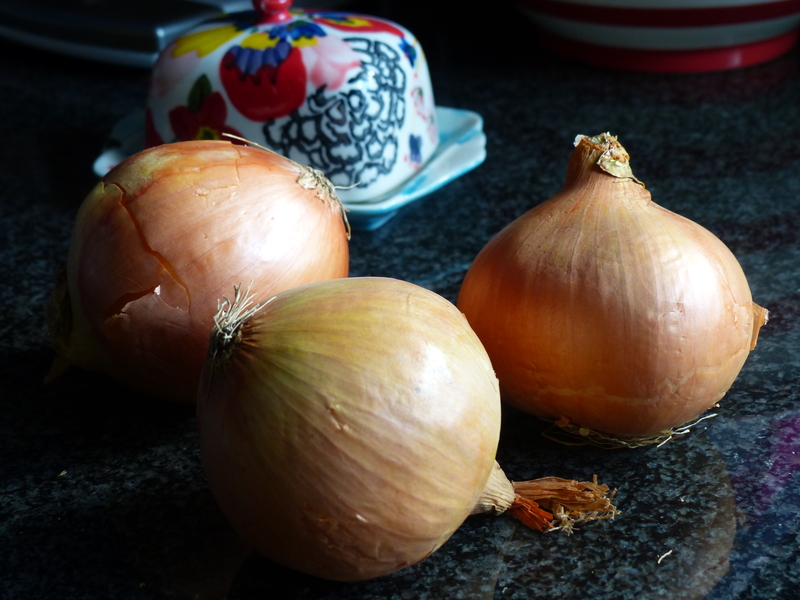 Cook for 30 to 40 minutes stirring occasionally (every 5-10 minutes), until the onions have turned an even, deep, golden brown. Turn heat down a bit if onions start to burn. Preheat oven to 350°F / 175°C. Sprinkle in the flour and stir for 2-3 minutes. 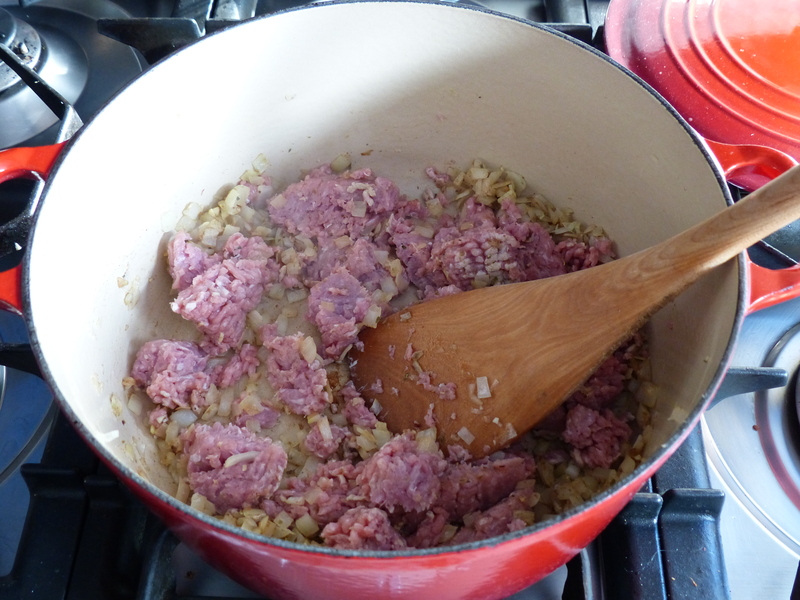 Off heat, blend in the boiling stock, scraping up any brown bits from the bottom of the pan. Add the wine and season to taste. Simmer partially covered for 30 to 40 minutes or more. 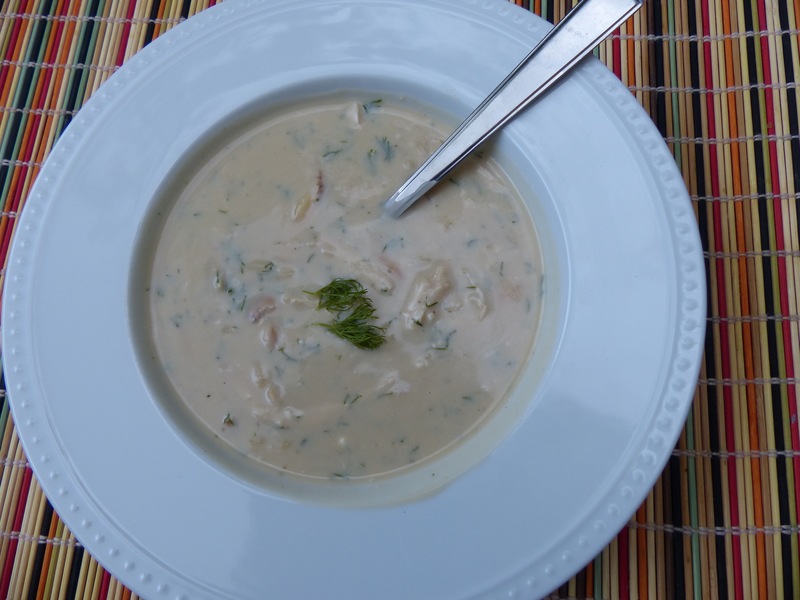 While simmering, cut baguette into 3/4” (2 cm) to 1” (2 1/2 cm) thick slices (allow 2-3 slices per bowl of soup). Place bread in a single layer on a rimmed baking sheet and bake until dried out and slightly browned, about 5 minutes. Remove from oven and sprinkle bread with grated cheese. Put back in oven and bake until cheese is melted, about 3-4 minutes. If you prefer your cheese lightly browned on the top, place under the broiler for a few minutes. Ladle soup into bowls. Place 2-3 cheesy toasts atop each bowl.